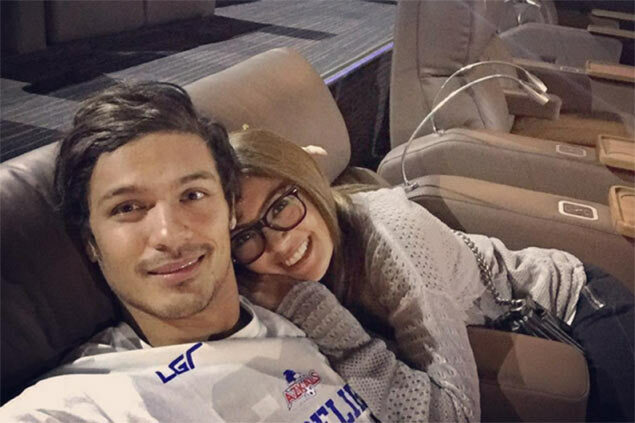 SAM Pinto, FHM Philippines back-to-back Sexiest Woman winner in 2011 and 2012, finally confirmed her relationship with Azkals winger Misagh Bahadoran. In an interview with PEP.ph, Pinto finally came out and addressed the rumors surrounding the state of her love life, confirming that the rumored Filipino-Persian she's been dating for months is indeed Bahadoran. “Yup, we're together. We’re good, we’re very happy,” said Pinto, adding that they have officially been a couple for three months now. Bahadoran, who plays for Global FC in the UFL and has been suiting up for the Azkals since 2011, has even started to pick up a new sport thanks to the actress who's an avid surfer. "I'm the one who's been surfing. Four years na. Matagal na. And that was his first time to surf in the beach," Pinto said, when asked one of her Instagram posts where the sweet couple stand beside each one's surfboard. Off to surfing with this cray cray @sampinto_ ?